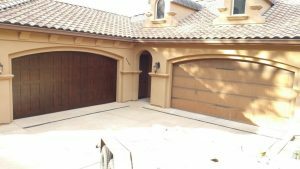 Our customers called us wanting to install some custom garage doors on their home as part of a home renovation they were doing. They were interested in the carriage house style, so we got to work picking out new doors that suited their taste! Their doors weren’t so bad to begin with. A bit weathered and in need of a paint job. But the homeowners really wanted brand new doors. The doors they chose are wood and steel backed. Not only do the Carriage House doors look great, they are amazing quality that will last for years. We installed one set of doors, and still have another to go, so you can get a good side by side comparison below! Not to mention the new doors just look better and are better quality than the old, weathered doors. 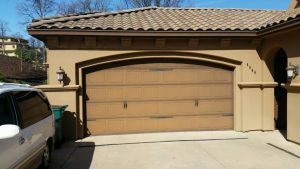 But the dark, richer color of the new doors compliments nicely in contrast with the lighter exterior paint. If we were just repainting the old doors for an inexpensive makeover, we’d definitely go with a darker color! The best thing about the Carriage House doors is getting to customize the hardware to get a specific and unique look! The customers went with some beautiful iron handles and rivets. 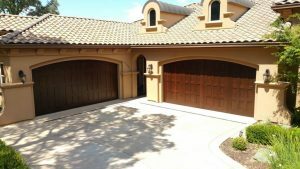 Carriage House offers many different styles. Including: Tuscan, Barcelona, Park City, Virginia, Carolina, Santiago, Cambridge, and more. You can see the styles here. You can see the final look on this beautiful home!